fosters the success of women in the workforce throughout Western New York; offering career advancement resources, work/life strategies, leadership development, and personal and professional connections. Everyone is welcome to attend two of our events as a guest. This does not include the December or June fundraisers. After the second regular meeting, you attend, we will ask you to join our organization. 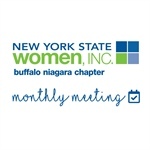 Want to voice your opinion about NYS Women Inc. and have your voice heard? We will be having our annual business meeting where we will have table captains leading the discussion. Our annual event honors these inspiring women who have been an essential part of WNY’s growth as a community. Our Women in Leadership, have empowered women personally, professionally, and politically. Are You Ready To Become Member? Join Today! In 2018, shortly after Peggy Sullivan’s father, Ted Kahn, passed away, she decided to celebrate his life with a legacy that would endure the test of time. The result is SheCan, a nonprofit, membership-based organization focused on providing tools and resources to help woman become the best version of themselves in all aspects of their lives.